The Screeming Green Meenie is our first Level 1 (easiest to assemble) flying rocket kit. She sports our unique tube/flat fin combination that gives great stability and flashy looks. The SGM is easy to assemble and is perfect for the experienced rocketeer as well as beginners. 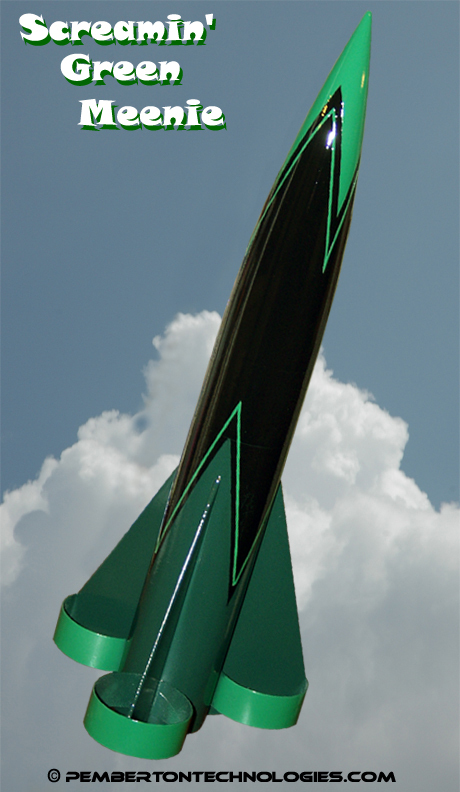 Purchase a Screamin’ Green Meenie and impress the girls, strike awe into the hearts of your rocket geek peers and be the envy of unfriendly nations worldwide! Kit come complete with plastic nose cone, laser cut balsa fins and heavy-duty centering rings, precut tube fins, 2.6″airframe, 16″ parachute, 60″ KEVLAR shock cord, 24mm motor mount, launch lug and our infamous Destruction Manual.